Before designers even begin to consider the user interface of the application, there is one critical process that must happen first: product thinking. When developing a software product at Making Sense, product thinking is a priority. There is a significant amount of considerations that must happen before an application reaches the market. Product thinking is a critical process we should take into account as a first step, even before designers begin to consider the user interface that will underpin the application. However, this doesn’t mean that application developers can simply throw together a product and hope it works. Product managers and founders can sometimes get carried away with themselves, thinking in terms of the features an application will include, as opposed to considering the application and its experience in a more holistic manner. Bearing this in mind, we should know that features don’t work without products, there is a one-way relationship between these two concepts. Product thinking requires product managers to take an ever-more global approach to their considerations. “As a matter of fact features by themselves don’t even make up the underlying UX”. Taken individually, these are a small portion of the product that may address part of a user’s problem – the reason they decided to utilize the application in the first place. On the contrary, product thinking requires teams to take a more overarching approach to their considerations, thinking instead about the main issue the user is seeking to solve or the job the product was hired for. Having UX as a core, a product grant value when it solves any problem people might have or it fulfills any need. Product thinking includes a set of considerations that are easy to miss. Somewhere between the thinking involved in UX design and that associated with product management, lies product thinking, making it a sometimes difficult mark to hit. However, when product managers and founders seek to think outside the box and look at the idea for their product from the point of view of the user, this can help get the ball rolling. Oftentimes, the user himself may not be 100 percent sure of the problem he is aiming to solve. This makes it even more difficult for the development team, to ensure that they are providing the right value in the product. If there is a non-existent problem, or the solution doesn’t fit the problem, the product becomes meaningless and people won’t use it. Problems: What problem will the product solve? 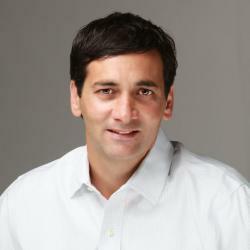 Target Audience: What user audience will use the product? Vision: Why are we creating this product? Strategy: How will we do this? What solution will the product provide to address the problem? Goals: What do we want to achieve with the product? Features: What are we doing? What capabilities will users have to address their problem? In this way, features are the final piece of the puzzle, after the problem has been pinpointed and a rough solution has been considered. This way of thinking helps our development team create features that will be successful in addressing the nearby problem. One of the key pieces of product thinking requires that the team first determine the potential problem users are having. This helps us guide the rest of the process, helping the team create a viable and valuable solution to the problem at hand. However, it’s almost impossible for the team, as well as the client or founder, to be 100 percent sure they are identifying the right problem. This level of uncertainty can bleed onto other portions of the process – including the creation of the solution. When applying product thinking to the development process, it’s critical to take the temperature, so to speak, of those that will be utilizing the product. Therefore, taking the time to talk to potential users to ensure the team is recognizing the right issue and creating a viable solution is an invaluable step in the process. This is the approach that we encourage at Making Sense. Instead of simply brainstorming on our own to identify and solve the issue, we create a visual representation of the product development process, including all the steps involved as well as the specific pain points the company was experiencing. In our own Development Framework, this process is part of the Discovery phase. This approach of recognizing the pain points as well as the overall process introduced new considerations that aligned our team’s use of product thinking. We provide a 360° overview of the product, the business and the value this product might offer. 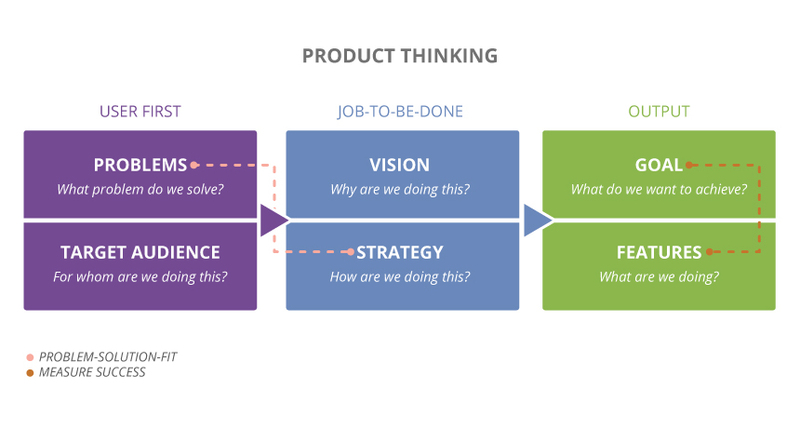 Product thinking can be a difficult concept to master. However, when we begin weaving this approach into our preliminary planning, the team creates a product that provides true value to users. Product thinking is distinctly different from user experience – although the product thinking process contributes to the establishment of the UX. Speaking with users is paramount. This step helps the team recognize the right problem, and frames the solution the product will provide. The product’s features should be the final consideration of product thinking, as the process will help lead the team to features that help solve the identified problem. The combination of ideas and strategies is endless, and we love to provide every project we do with value and prompts that makes them stand out in the market. However, the product thinking process is paramount. That’s why we offer a complete team who can help you to develop any idea you might have, keeping in mind features and products and how do they interact. Contact us if you are you planning to develop any software project. Our team aims to provide meaningful apps that users will enjoy. Nobody can deny that CES is one of the most influential events of the year when comes to technology. Today, I'll share a few impressions, including my top 10 picks from the event.